The Wolf Snail is not covered in fur, doesn't howl at the moon and doesn't live within a fascinating social structure. It is a vicious predator, though! So that's... good. There are more than 40 species of Wolf Snail within the genus Euglandina, all living in the warmth of south-eastern United States through to South America. The most well known species by far is the notorious Rosy Wolf Snail. They're large and quite attractive, with a slender body some 10 cm (4 in) long and a shell that almost looks aerodynamic. They don't move so fast as to need an aerodynamic shell, but they do move pretty fast. Certainly faster than the average snail. They need to, because they EAT the average snail. But first things first. How will they find a nice, average snail to eat? If you take a look at a Wolf Snail's face you'll see that it has what looks like an extra pair of tentacles. Aside from the eye stalks and the little tentacles lower down, there's a kind of weird, Daliesque moustache waving around and tapping the ground. I'm sure Dali would've simply loved for his own moustache to move like that! The thing about the Wolf Snail's moustache is it's extremely sensitive. It's like a pair of tongues licking the ground in search of the mouth-watering flavour of snail mucus. 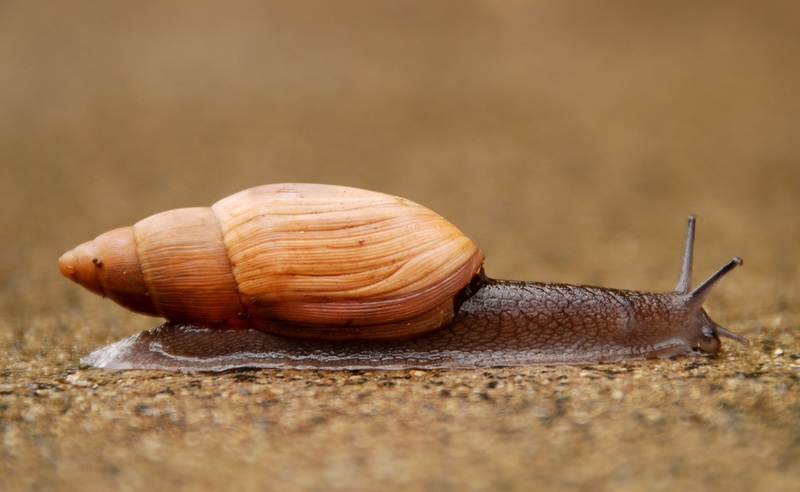 Most people try to avoid most kinds of mucus, but for a Wolf Snail, it marks the beginning of the hunt. Probably Dali wouldn't want taste buds in his whiskers. He'd just have the taste of Brylcreem or some kind of moustache wax all day. Possibly a bit of mucus, too. 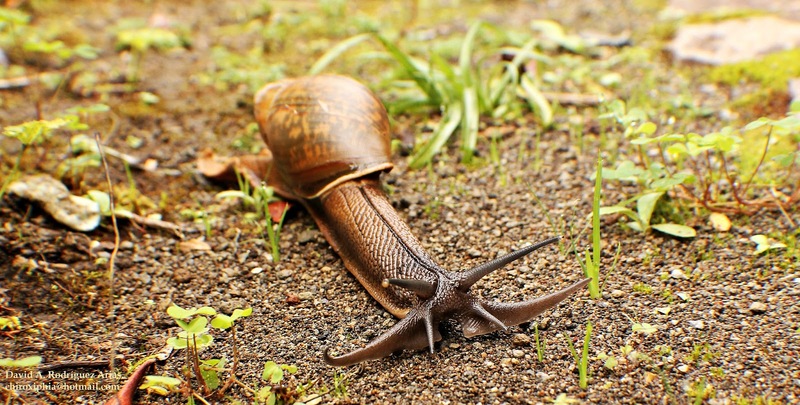 Once a Wolf Snail gets a taste of a snail trail they follow it like a bloodhound. Their tongue-moustache things frantically tap-tap the ground as they chase after their quarry. With their (faster than the average) snail's pace, the Wolf eventually catches up with its prey, tears it up with its fearsome radula and eats it. Their long, slender shape and long, slender proboscis also allows them to dive right into their victim's shell to swallow up every last bit. There is no escape. Wolf Snails are so accomplished and voracious that they've sometimes been introduced into other parts of the world to help control pest snails. The pest in question was frequently the Giant African Land Snail, which was also introduced around the world. What a great idea! Armies of hungry mercenaries are always fun! It's the unpredictability I like. You never know what they'll do next. You can be reasonably sure they'll be killing stuff, is just that the "mercenary" bit means they don't always kill the people you want them to. With hilarious and/or disastrous results. So it was with the Wolf Snail. It was hoped they would feast on the vast platters of meat offered by the enormous Giant African Land Snails. And perhaps they did... to an extent. The problem is that Wolf Snails also like to eat their prey whole, shell and all. When they digest their prey's shell they can use the calcium carbonate to build their own shell as they grow. And that means that Wolf Snails are partial to whatever bite-sized snails they can find in their habitat. Perhaps the most disastrous result can be seen in Hawaii. Wolf Snails were introduced in 1955 and in just a few decades, hundreds of native snails were instinct. 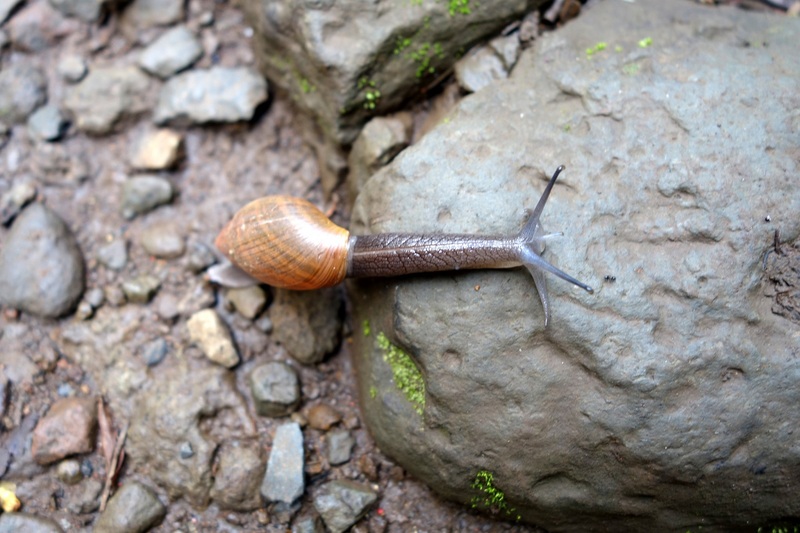 Hawaii once played host to 40 species of O'ahu Tree Snail. They're pretty little things that featured in local songs and their shells were used in ornaments. Today there are just 10 or so species left, and all are considered endangered. Moral of the story? If you're going to use mercenaries, make sure they sign some kind of legally binding contract first. Even if they sign it with an "X" instead of a name and use mucus instead of a pen. not so much into the killing part, but their shell looks like wood! pretty! The front part looks like it's trying to go faster than the shell part can manage! Hmm I wonder if you can use some members of the Leucochloridium to keep them at bay. How could a snail like that eat another snail ? Or at least try it in a small controlled area first.. using animals to get rid of other animals is great but you can't just leap into it..
@TexWisGirl: Yes! They're really nice to look at when they're not eating! @Crunchy: Haha! I think that's a common plight for snails! @unknown3: Ooooo... That might work. Or be a whole 'nother disaster! @karim galal: I guess they have a sufficient;y deadly radula and an appropriate appetite. @ColdFusion: I guess it works best when you can find native animals to use. Importing species from around the world is always going to be a sad story for biodiversity. Fucked up for Hawaii 🐌 snails.